Details about the return of a marble lekythos to Greece are beginning to emerge (see Press Release from the Hellenic Ministry of Culture [in Greek]). The piece, almost certainly looted from a late classical cemetery in Attica, now appears to have been identified from photographs seized in some police operation against looters (though it is unclear if these were Polaroids seized in operations in Switzerland and handed over to the Greek authorities in 2005). 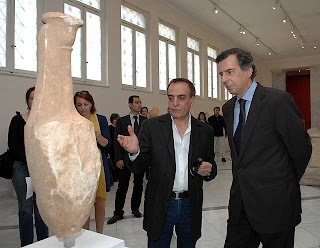 Michalis Liapis, the Minister for Culture, has stepped up the campaign against looted antiquities in Greece. He has also indicated that other objects have been identified from photographs and that more returns can be expected in the near future. It will be interesting to see which further pieces will be returning to Greece.